Speech therapy activities – Being Creative! Being creative with therapy is a must! 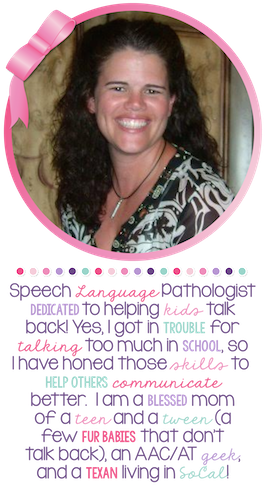 For a student that has significant deficits, they might spend a great deal of time in speech therapy. Looking at the same articulation or language cards can get boring. I get bored, so I know my students and clients get bored! When boredom set in, we can have a decrease in productivity or even an increase in behaviors! We need to make speech therapy fun but functional! Thus creativity becomes a plus. Ideas for speech therapy activities! Poppers – oh what you can do with poppers for speech activities! Place their target on the floor and have them try to hit the target. This is a great way to work on coarticulation and length of utterance. While working with a client who is at 3-4 syllables phrases with s-blends, I had him say “I pop a snake” or “I hit a snake” for example. They we worked a bit on turn-taking and he shared the popper with me. He then would say “you hit a snake”. For early communicators, this is great for CV utterances and interactions. “Wow, oh, pah, bah, pop, up, go” are some of the targets you can use. Great for following directions! I will have the students take turn with the poppers. I then ask them to find something using target basic concepts/prepositions and then hit it with the popper. So for example I might say, “hit the book that is on the bookshelf” or “pop the bottom of the trashcan”. Throwing Cards – Yes, I said it! THROW THE CARDS! I aim for their feet or for the ground around them (most of the times). If it is a group with lots of energy, I make it a bit of a dash to get their cards. Now, this game can easily get out of hand, so I only use this with small groups or individual clients. House of Cards – My CFY year, I remember trying to keep the students from handling and messing with the cards. Then I saw a blog post about how the SLP let the kids build houses with their “correct” cards. Motivation…Motivation…Motivation! So when a student gets a target correct, they get that card to build their masterpiece. Sometimes I am even nice and give them a tissue as a base support! « What’s in your cart?